On Saturday, March 23, Felician associates and candidates in Enfield, Connecticut, enjoyed a presentation by Sister Theresa Marie Grochowski about her role at St. Bernard’s Parish. Sister Theresa Marie is a Eucharistic Minister for the parish and brings Holy Communion to those who are homebound or staying in nursing homes and hospitals. For many, she also brings a tangible comfort: prayer shawls. The prayer shawl ministry was started in 1998 by Janet Severi Bristow and Victoria Galo, who were inspired by their participation in the 1997 Women’s Leadership Institute at the Hartford Seminary. These two women combined their love of knitting/crocheting with a desire to bring comfort and solace to those who are sick or homebound. The making of the prayer shawls is a prayerful ministry. The person making the shawl begins his/her work with prayer and a blessing for the recipient. With each stitch, the shawl-maker offers prayers and blessings, and the shawl is blessed once again before it is given to its new owner. A prayer card and medal accompany each shawl for the recipient to pray as the shawl is being worn. 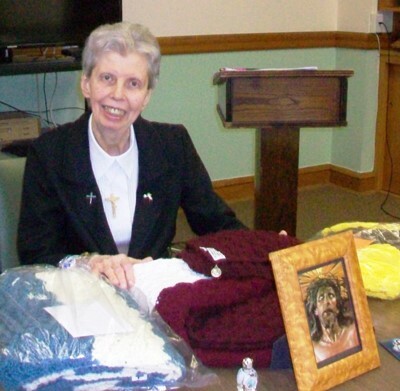 The prayer shawl ministry at St. Jeanne Jugan Parish began in 2003, under the direction of Joan Martinez, who remained true to the mission statement created by Bristol and Galo. Now there are 10-14 women who meet monthly to create the shawls. So far, approximately 1500 shawls have been distributed.